Nick was born in 1982 and grew up in Humboldt, SK. His family was involved with swine barn ventilation systems and barn design, which introduced him to animal agriculture at a very young age. After high school Nick worked with every production animal he could, including salmon, bison, swine, dairy and beef cattle. He completed a Bachelor’s degree with Distinction in Agriculture (majoring in Animal Science) from the University of Saskatchewan in 2010. That fall he began studying at the Western College of Veterinary Medicine. After obtaining his DVM in 2014, Nick moved to Ogema, SK where he worked in a mixed animal practice with a strong cow/calf client base. 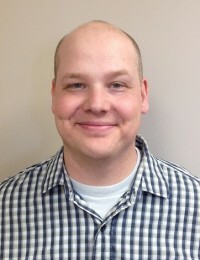 In 2015, Nick had the opportunity to focus his career solely on food animal production medicine and management by joining the Warman Veterinary Services team at the Emerald Park office. Nick is involved in both dairy and swine production medicine. His interests include production medicine and surgery, calf/piglet management, metabolic disease prevention and barn design to maximize production and minimize stress. Nick enjoys outdoor pursuits, from hunting and fishing to snowshoeing and canoeing. He has a 7 year old dog Bryx, and loves exploring the city of Regina and all it has to offer. Nick also travels to visit family from Saskatoon to northern Ontario, when time allows.